In a rare decision, the Criminal Appellate Division Bench of Delhi High Court has delivered a split verdict in five criminal appeals preferred by the accused who stood convicted by a trial court for allegedly having committed murder in a road rage incident in Chanakyapuri in 2009. The case related to the murder of Ankit 23-yr old son of property dealer Rajiv Minocha near Chanakyapuri in 2009. 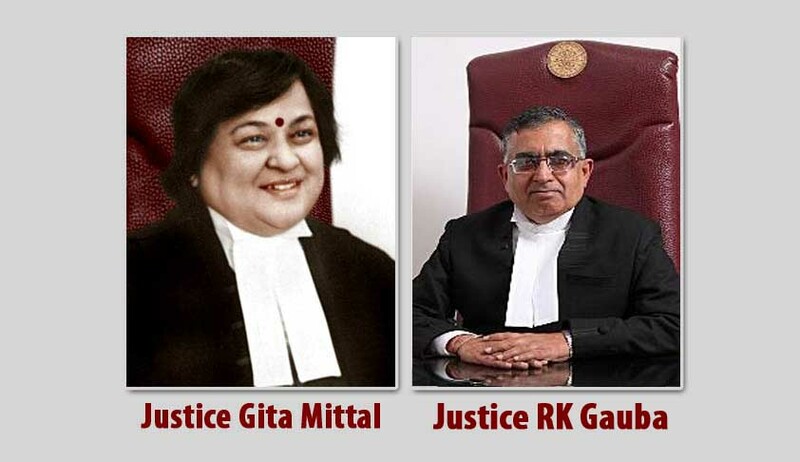 The Division Bench comprising Justice Gita Mittal and Justice RK Gauba was hearing appeals against the judgment of additional sessions judge, New Delhi, by which the trial court held the appellants guilty for offences punishable under Sections 302 and 307 read with Section 34 of Indian Penal Code, 1860 (IPC), and sentenced them to imprisonment for life, with various amounts of fine to each of them. While Justice RK Gauba upheld the conviction and sentences awarded by the trial court, Justice Gita Mittal acquitted all the accused. According to Justice Gauba, the trial court had appreciated the evidence in proper light and reached correct conclusions on facts. “I, therefore, find no merit in the appeals challenging the conviction returned by the trial court through the impugned judgment. Having regard to the facts and circumstances. I am of the view that the punishments awarded by the order on sentence passed by the trial court deserve to be enforced for both offences i.e. under Section 302 and Section 307 IPC each read with Section 34 IPC, the substantive sentence (imprisonment for life) on each count to run concurrently,” he said. But Justice Mittal held that the prosecution failed to establish the charges against the appellants beyond requisite standard of proof beyond reasonable doubt. She opined that it is not a case of mere insufficiency or inadequacy in the investigation by the police. “It is also not merely inept handling of the investigation by the police. On the contrary, the present case manifests the manner in which innocent persons can be implicated for commission of heinous crimes and incarcerated for years,” she said. The prosecution failed to establish by credible evidence its case that the appellants were occupying the vehicle from which firearms were used, resulting in the death of the victim. There is gross unexplained delay in registration of the first information report by the police station, which was located barely a couple of kilometres from the place of incident, despite evidence of eye-witnesses being available at the spot when the police reached the place within minutes of the incident. The prosecution also failed to establish compliance with the mandatory requirement of sub-section 1 of Section 157 of the CrPC. The eye-witnesses, who were close associates with the deceased and co-passengers in his vehicle at the time of the incident, failed to lodge any report with the police, which creates doubt on their subsequent testimony. The propounded public and other eye-witnesses were complete strangers to the accused. Even if the prosecution case is accepted in its totality, the witnesses would have best had only a fleeting glance at the vehicle occupied by the assailants. The circumstances, which obtained at the scene of the crime, were such as to render identification of its occupants impossible. The prosecution either failed to conduct test identification parade of the arrested appellants or did not conduct the test identification parades with expedition and promptitude after the arrests of the appellants. The dock identification of such complete strangers by the witnesses more than a year after the occurrence was not credible. The prosecution failed to establish that the appellants made any disclosure statements leading to recoveries which would become admissible by virtue of Section 27 of the Evidence Act. 1073. The accused led strong defence evidence, which creates a strong doubt in the prosecution evidence. Though Justice Gauba penned his judgment first and gave it to Justice Mittal, he had modified his judgment in view of the dissenting opinion from Justice Mittal. The appeals will now be placed before a third judge after obtaining orders from the Chief Justice, in compliance with Section 392 of the CrPC.